Everything about the Japanese earthquake outside of Sendai is terrifying. The casualty numbers are so high, or at least expected to eventually be so high, that it’s numbing. So what do I do? I think of it in terms of film. I’m not alone. Bill Nye, for instance, referenced The China Syndrome during his time on CNN explaining the nuclear meltdown process. WB immediately pulled Clint Eastwood’s Hereafter from theaters in Japan because the film opens with a tsunami wiping out a resort town. But from the outside, the cell phone camera shots of the actual tsunami are much more frightening. You can see the hand shaking with terror in those, while everything in Hereafter is clearly CGI. Not to say this is the wrong decision — it’s not — but they have no power to screen the film anyway, so it could have been done quietly. But I don’t know anything about nuclear meltdown, and I don’t know anything about tsunamis. I just know about film. And I know that one of my favorite directors, Iwai Shunji, comes from Sendai. Aside from donating money there isn’t a lot most of us can do except stare slack jawed at the video footage as it comes in. One thing we can do is take a look at the work of the man from Sendai and get a little bit of a better understanding of the general area. Filmed in 2001 a few miles south of Sendai among the lush rice paddies of Ashikaga, All About Lily Chou-Chou is the story of the descent of youth, seen through the eyes of a high school class that is splitting apart at the seams. It is a painfully honest exploration of bullying, the beauty of the photography and Kuno’s (Ayumi Ito) Debussy solos belying the helpless feeling that the film leaves you with. But the film’s main interest is not how to stop bullying, or even defining what bullying is. The film’s main interest is what causes someone to become a bully in the first place, and how it turns the world upside down. The film finds Japan at a cultural crossroads, as the new generation of youth is starting to come into their own, but on very unsteady footing. The film’s main characters, Yuichi (Hayato Ichihara) and Hoshino (Shugo Oshinari), are fairly typical junior high school students having a rough time adapting to the new conditions of a larger school environment. They are still fledglings in that sense, but the pressures they face cause them to try their hardest to soar with still maturing wings. Yuichi is a reserved, quiet boy from a broken home. What personal voice and confidence he has at the beginning of the story is quickly washed away by little fish syndrome as he comes into contact with the more alpha male (and female) classmates. He often hangs in the background with his head down, and along the way can only find comfort in the ethereal pop music of Lily Chou Chou (voiced by J-pop singer Salyu). Hoshino, on the other hand, is smart and wealthy, a class leader asked to give a speech on behalf of the incoming students. He shrugs off the fact that everyone but Yuichi secretly, or openly in some cases, hates him. Yuichi is the only one he opens up to about this, but Yuichi seems somewhat bewildered by this opening of emotion from Hoshino and himself shrugs it off. Life changes drastically for Hoshino in the summer of 1999, first starting with a trip Yuichi, Hoshino and their friends take to Okinawa. This trip is a key moment in life for Hoshino, as he has two near-death experiences. If the first one shook something loose in his head, the second seems to contain the incident that changes his character the most visibly and unalterably. He is simply different in the next few moments. Problems with his family when he gets back home open the fissure up even more. It also turns out to be a key moment in life for Yuichi, whose life is irrevocably altered when he is sucked in by Hoshino’s strong-arm gravitational pull against his will. Despicable doesn’t accurately describe the awful things that Hoshino – or others because he demands it – has done, or will continue to do. He is an über-bully. Like Daniel Plainview, he’d rather own you to the point of complete destruction than to get his hands immediately dirty. He is not deserving of any sympathy after returning from Okinawa, nor does he find any. I do believe he is deserving of empathy, though, or there is no point in watching the film. Though initially blessed with wealth and gifted with brains, fate has seemingly conspired against him that summer and he did not have the strength to continue shrugging it off. His life has spun out of control and instead of helplessly watching it circle the drain, he picked up his rage and went the other way, recreating his misery for everyone he comes into contact with. As such, the parents and teachers in this film are just as culpable as any of the kids. At no point do any of them have any semblance of control, nor do they look willing to try. The kids are left to themselves to run amok, or to run away. “Kids these days are scary,” Yuichi’s mother says during a news story about a high school student who takes a city bus hostage, completely unaware of what Yuichi has become because of Hoshino. It’s not something Yuichi can confide in her, or anyone, and not something she could guess. 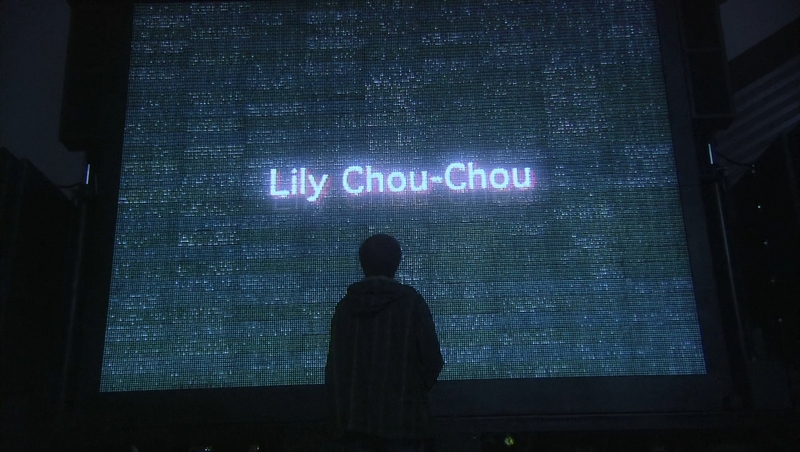 So to avoid confronting the horror that his life has become, Yuichi buries himself in a message board dedicated to Lily Chou-Chou where he finds that he is not as alone as he would seem, spending countless hours in conversation about Lily and the ubiquitous ether that, to them, her music is culled from. Iwai does something completely innovative here, allowing the text of the message board to appear on screen as typed, instead of on a monitor in the screen. These anonymous names – like Bear, Pascal and Blue Cat – are just as important to the film as any other. More and more, this is how kids connect to one another. Not face to face, but avatar to avatar, like a shunt to relieve the overwhelming pressure of life at that age. It creates a delicate mood, one that contrasts and balances the film at the same time. But this running textual motif makes it a difficult film to grasp at first. The film offers a constant stream of information, making heavy demands of your attention otherwise you will suddenly find yourself completely lost in the maze of these overlapping lives as they make their descent. All About Lily Chou-Chou could almost be classified as a horror film as Hoshino drags his class down with him. The depth of Yuichi’s suffering, because of the things he does and are done to him, is more palpably scary than any BOO! films can muster. But through Iwai’s lens, the film is loaded with tenderness for these characters, these lost, broken kids, willing someone to notice what is happening, screaming “please, look!” into the void, hoping someone shouts back “okay”. Of all of the filmmakers in the world, Terrence Malick makes it the hardest to form an opinion on his films after one sitting. He doesn’t really make films as much as he makes complex, dense, highly populated visual poems with cameras and actors. While the films always maintain an airy, easygoing charm, each second that the film is unreeling a new idea presented somehow. This isn’t because his films are unfocused; rather the opposite, his films are so highly focused and expect, demand so much of the viewer that to watch it once is almost a crime. Despite resting on the bed of a relatively simple plot about a Texas family in the 1950s and 60s, The Tree of Life simply defies description or label in the traditional sense. It is about life, but in the most indescribable way possible, which is something that Mr. O’Brien (Brad Pitt) himself struggles with (and eventually mucks up) greatly throughout the film. The idea of this film is what he is trying to convey to his three sons, and to his wife (the wonderful newcomer, Jessica Chastain), and he cannot do it properly. Yes, he can teach them manners, and even how to fight — but this, this is something else. Jack (Hunter McCracken) eventually takes the wrong lessons out of the fragments that his father can give to him. It’s not his fault, no one can put these concepts into words, not even Terrence Malick. Hell, not even the Bible is of any use. To that end, it is not actually a film about a Texas family in the 1950s and 60s, that’s just where most of the concepts unfold. The film spans in time from the Big Bang through to the modern day, where the eldest son of the family, a now middle-aged Jack (Sean Penn), has become lost in some sort of emotional netherworld due to a mixture of the delayed turmoil of his brother’s death (at war, one would assume, though it is never confirmed) and the subsequent distance from his family as well as the decaying blight of modern’s man effect on the planet. Malick finds an overriding beauty in the smallest elements of life (the most beautiful shots in the film are of a simple sunflower patch), but man has scarred this beauty with skyscrapers and greed. This natural beauty is science formed, though, not God formed. Malick goes out of his way to deliver this message with a lengthy and stunning creation sequence, where trial and error, natural experiment on a planetary level and natural selection rule. Life is eventually formed and fostered formed out of the nascent planetary gases, and man comes of this. But man ruins it: he is different. He thinks. He blushes. He destroys. He creates God for order, for peace, and the Devil to blame when, inevitably, neither of these happen. It could be viewed as possibly the greatest argument for a Godless universe, where man is the annoyance, the “thin film of life” so invisible, yet so ignorantly wrapped up in its own existence, as Carl Sagan put it. One almost gets the sense that nature is waiting us out, and it may be. But The Tree of Life stands upright as a visual document (the creation sequence itself will be re-released later this year in IMAX), and Malick and his team have created something more stunning than The Thin Red Line. What it stands for poetically will take a little longer to put it into proper perspective, but this is doubtlessly a major work of art, and it must be seen. In a way, it’s hard to believe guys like this actually exist. I don’t mean that in a just world guys like this wouldn’t exist, because I personally have no stake in it either way, but in the way that it’s hard to believe that super models actually exist in the flesh. I mean, they must, if only in secret, because places like Vegas exist and the root of these films comes from a true (supposedly) crazy bachelor party weekend, but I’ve never met any of them. Thanks to the magic of movies, I don’t have to. The movie gods have brought the boys to Thailand this time, and set them lose on the streets of Bangkok to drink themselves into amnesia, losing Stu’s (Ed Helms) sixteen-year-old soon-to-be brother in law, Teddy (Mason Lee), along the way. In order to find him and save the wedding the boys must once again retrace their steps and endure the wacky hijinks and have profound discoveries of self to find the keys that they cannot remember. The major complaint with The Hangover II seems to be that it’s basically the same exact film as the first one. But I honestly don’t see that as being a valid complaint because it’s laid right out for you in the trailer. You have been warned. You should know from the glut of sequels to wacky comedies anyway. The whole feel of the movie — just like every other comedy sequel — is, “whoops, we did it again, only worse.” That’s the promise made, and that’s exactly what the movie delivers. Whether that’s your cup of tea or not isn’t up to the filmmakers. Everything, in fact, from the first movie is back again — the good, the bad and the ugly, but this time the ugly is a little uglier, and more bald. But this time, instead of a tiger there’s a drug dealing monkey who holds the key to finding Teddy. But the bottom line is this: it was true of the first film, and true of this one. The slideshow of pictures at the end were the only really, truly worthwhile moments. There are laughs throughout the film, though, I won’t deny that, but they are mostly empty, easy laughs. The kind of laughs that are so easy that in Talking Funny (HBO’s comedy documentary featuring Chris Rock, Jerry Seinfeld, Louis CK and Ricky Gervais talking about their stand up careers) the comedians spend 10 minutes talking about how they refuse to keep this kind of material in their act despite it killing night in night out. There is no real skill in creation involved, just skill in execution. Who could say that this wasn’t executed flawlessly? That’s what this film boils down to, though: crowd pleasing, easy jokes. Pay your $13, click off you brain, and laugh at the monkey. If you didn’t expect that, it’s kind of your own fault.